I’m currently working towards a master’s/PhD in social work, and as part of it I did an internship at a homeless shelter last summer. A lot of people there had mental illnesses, a lot of people were veterans, and a few of the people were both. For some of the stories in my collection The Futility of Loving a Soldier, I created characters that were composites of people I met last summer. The main character in “Crash,” one of those stories, is a composite of female vets I met. Lindy has just returned from Iraq and is a bit jumpy (something very real for our vets, many of whom can’t handle fireworks because it reminds them of their experiences). Her dad knows he needs to help her but isn’t sure how. “What do you think?” Her voice was muffled too, just like the music. He couldn’t quite place where she was, so he turned down the stereo volume and glanced around again. She sat in the corner between her bed and the wall, curled into the fetal position, head resting on arms curled tightly around her knees. 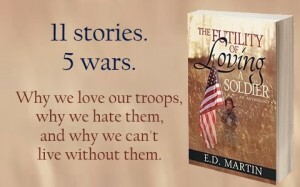 Read more about Lindy in The Futility of Loving a Soldier, then post a link to your eight sentences blog entry, or join the fun at the Weekend Writing Warriors website. Aww… that’s tough. Sounds like she needs the kind of help he can’t give her–that needs a licensed professional. Your short stories will give people a sense of what it’s like for love ones of veterans with post traumatic stress. Great title! OMG, the pain she’s left with after serving our country. Get help, dad and right away. Beautifully written. I just re-read this snippet and realized how, if she is in flashback-mode, this line means so much more… “He couldn’t quite place where she was”. I don’t know if that was quite your intention or not but it is absolutely apropos and a great piece. I admire the Dad for trying to help and he seems to be going about it wisely. Excellent excerpt! I was holding my breath. Didn’t realize it until the second time I read it. Perfect scene, ED. Boy do you know how to hook the reader. I’m so curious. Two hurting people who are so afraid of hurting each other more…. A strong scene.